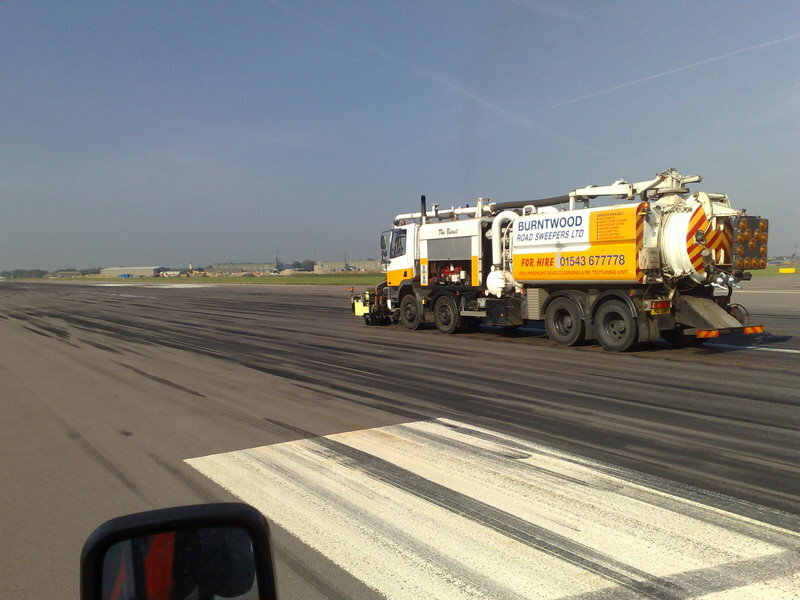 The need for the safe and fast removal of rubber deposits from airfield runways is well documented. Rubber build-up from increasing numbers of flights with ever heavier aircraft means regular clean-up operations. There are also decreasing time periods when the operation can be carried out. Our machine, designed with the experience gained over 20 years of working on most UK civil and military airfields, operates at 2500 bar pressure – which now seems to be the world wide industry norm. Our unique variable width “Z Blast” computer controlled machine powers the water through an oscillating system made up of micro- jets of water giving a definitive performance. The process can regularly achieve 700 m2 per hour, depending on the degree of treatment required. The treatment is also very aesthetically pleasing, giving a uniform finish. The process incorporates a very powerful suction recovery system and is designed to be one man operated, giving unrivalled safety for operator and passing vehicles.